Definition at line 112 of file socket.h. Definition at line 120 of file socket.h. Referenced by link_socket_init_phase1(), link_socket_init_phase2(), link_socket_read_tcp(), linksock_print_addr(), phase2_inetd(), phase2_set_socket_flags(), process_incoming_link_part1(), process_outgoing_link(), resolve_remote(), socket_recv_queue(), and x_check_status(). Definition at line 121 of file socket.h. Referenced by bind_local(), and link_socket_init_phase1(). Definition at line 115 of file socket.h. Referenced by inherit_context_child(), link_socket_connection_initiated(), and link_socket_set_outgoing_addr(). Definition at line 116 of file socket.h. Referenced by ipchange_fmt(), link_socket_connection_initiated(), and link_socket_init_phase1(). Definition at line 114 of file socket.h. Referenced by bind_local(), inherit_context_child(), initialization_sequence_completed(), ipchange_fmt(), link_socket_bad_incoming_addr(), link_socket_connection_initiated(), link_socket_current_remote(), link_socket_current_remote_ipv6(), link_socket_get_outgoing_addr(), link_socket_init_phase1(), link_socket_init_phase2(), link_socket_read(), link_socket_set_outgoing_addr(), link_socket_verify_incoming_addr(), linksock_print_addr(), multi_process_float(), multi_tcp_instance_specific_init(), phase2_inetd(), phase2_socks_client(), phase2_tcp_client(), phase2_tcp_server(), resolve_bind_local(), resolve_remote(), setenv_trusted(), and tls_multi_process(). Definition at line 122 of file socket.h. Definition at line 117 of file socket.h. 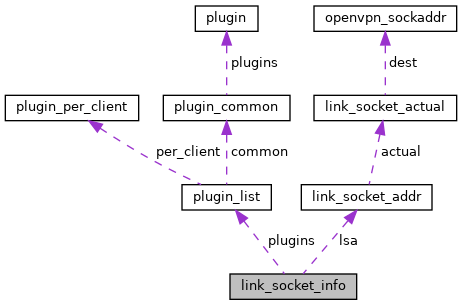 Referenced by link_socket_connection_initiated(), and link_socket_init_phase1(). Definition at line 119 of file socket.h. Referenced by bind_local(), link_socket_connection_oriented(), link_socket_init_phase1(), link_socket_init_phase2(), link_socket_read(), link_socket_read_tcp(), link_socket_set_outgoing_addr(), link_socket_verify_incoming_addr(), link_socket_write(), link_socket_write_win32(), linksock_print_addr(), phase2_inetd(), process_incoming_link_part1(), process_outgoing_link(), resolve_bind_local(), resolve_remote(), socket_frame_init(), socket_recv_queue(), socket_send_queue(), socks_postprocess_incoming_link(), socks_preprocess_outgoing_link(), and x_check_status(). Definition at line 118 of file socket.h. Referenced by link_socket_init_phase1(), link_socket_set_outgoing_addr(), and link_socket_verify_incoming_addr().